Gabriel Resources – a Canadian mining company, is currently suing the state of Romania over the refusal to grant a mining permit for what would have been the largest open cast gold mine in Europe. The mine was planned for the region of Rosia Montana, a beautiful town in Transylvania and UNESCO world heritage site. Gabriel Resources are demanding a payment of €4 billion to compensate for their lost future profits. They are using a UK / Romanian investment treaty through their London and Jersey offices to take this case. The legal action should send alarm bells ringing throughout the EU, and in the UK. Early next year, the European parliament is voting CETA, the Comprehensive Economic and Trade Agreement with Canada. It will expose European governments to similar cases if those governments decide at any time to prioritise the interests of people, their rights or the environment over and above the future profits of Canadian corporations or 40,000 US companies active in Canada. This will come into force in the UK if voted through regardless of the decision to leave the EU. Join us at 25 Southampton Buildings on Tuesday 29 November to protest against this toxic trade deal. Tackling racism remains one of the key challenges in our society. Refugees are still being left to drown or face squalor in camps such as Calais, while there’s beeen a rise in reported hate crimes in Britain since the referendum. And we’ve seen racism come to the fore elsewhere – from police killings in the US to burkini bans in France. But there has also been resistance. Refugees have refused to be locked out, while thousands have taken to the streets in the US and Britain to say “Black Lives Matter”, race hate crimes have been met by communities coming together to reject the scapegoating of migrants. Come to the public rally to discuss how we can build on all this to confront the rise of racism. The Housing Summit was what I’d expected it to be. It was amazingly well attended over 250 people surpassing the expectations of I think the organisers and attendees alike. It was heartening to see so many people. It had good coverage of London and organisations outside London, from Bristol and people from Norwich. The Conference had great speakers and the morning was taken up by Speakers followed by questions and answers. The afternoon was broken up into work shops. I attended the young people and housing work shop. There were young Londoners under imminent threat of eviction, some of which may have taken place by now. 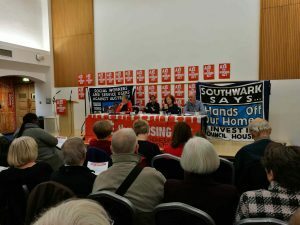 Luckily for at least one attendee the people from Camden council were in attendance and personally offered to help with one young man’s eviction notice. The brief was to come away with at least 5 action points from every work shop -of which I do not have a complete list now available to me, but to continue to organise and oppose around the housing act was at least one other workshop. Even though it was organised well, attendees from the floor wanted to be heard and share their stories. Time went quickly and we ended up having 10 minutes for lunch and rushing to our chosen workshops. There were excellent suggestions from the young people and the housing crises workshop. The one I can still recall was from a teacher who suggested that we go into schools and sixth form colleges to inform young people what is coming to them – Basically virtually no choices in housing whatsoever. Letting young people know and preparing them for what is going to be a very difficult task to make an adult lifestyle – having those lifestyle choices taken away from them, ensures that we recruit new activists while informing young people of their current reality in housing. There was some heated discourse on whether guardian agencies could be recruited into helping more young people into housing. This was controversial as usually the guardians have been put into housing that families once occupied as in Dollis Valley and perhaps they had absolutely no place in real housing choices for anybody. Charging extortionate rents and giving people even less rights than normal tenants. I have to say that even though I put my hand up all the time to ask questions and contribute, I was the only one representing Barnet and I was largely ignored and not allowed to speak. I think because all our stories are of people being evicted and not winning. It was clear to me that the organisers wanted only a positive contributions to the floor of the summit. Unfortunately I could not stay beyond 4pm so missed the summary and conclusions of other workshops but I know it was a successful day. It was reassuring to know that there is a real opposition amongst some councils that the housing act is unrealistic and untenable and unworkable even if they were not short of money, most councils would find it impossible to implement. Also I learnt that pay to stay is not law yet and should not be treated as such. Some councils at the other end of the spectrum are implementing policies, like Barnet for example, that are not yet law and can be justifiably refused by people. It was altogether a good day for axing the housing act and for networking with each other, getting to know new people in housing. Let’s end violence towards women and girls, SERTUC is committed to ending violence against women and girls so join us to mark the day when we get together to highlight the issues and work together to end it once and for all. 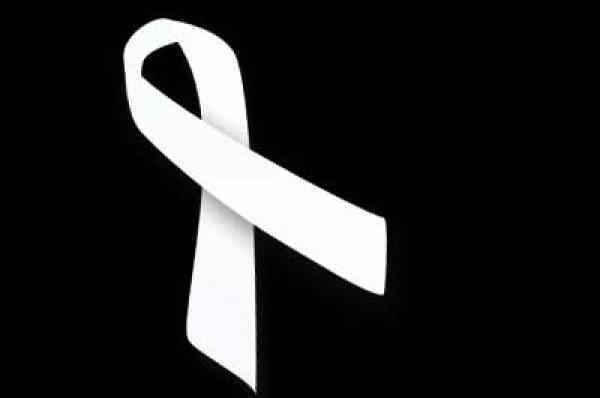 A conservative estimate by the UN states that 35% of women worldwide have experienced violence at the hands of another person and 43% of women in 28 EU states have experienced some form of physiological violence by an intimate partner in their lifetime. The ‘Helen/Rob’ storyline in ’The Archers’ has reached millions of people and, via a ‘just giving’ page, has raised over £98,000 for the women’s charity, Refuge. Please come to our Reclaiming the NHS public meeting on the 30th November 7-9pm, Council Chambers, Camden Town Hall Judd Street, London WC1H 9JE. The junior doctors strike has alerted us all that our NHS is being stolen from us. It can only be saved by a massive public campaign. And others: consultants, midwives, carers, ancillary staff, cleaners, patients, disability & other campaigners, and entertainers are being invited to speak. MPs and councillors will be asked to respond to what’s being raised. Called by Camden Momentum. We invite all Momentum groups, Labour Party branches, NHS campaigns, community organisations to endorse this meeting and circulate this information widely. Food and beverage will be available to buy from behind the bar. 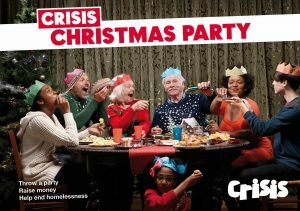 As it is so near christmas we have decided to have christmas theme – donation at the door – proceeds to Streets Kitchen which will be used for distributing meals/clothes/info for the homeless. As the crisis in Syria deepens, the British establishment is gearing up for further intervention in Syria. Along with our existing interventions in Afghanistan, Iraq, Libya and Syria, the rhetoric of further war as a solution to the catastrophic situation in the Middle East is being ramped up. As the government whip up hysteria around Russia to levels unseen since the Cold War and make horrendous propositions of a direct military confrontation with Russia, it is imperative that we understand why more war is never the solution and organise around it. 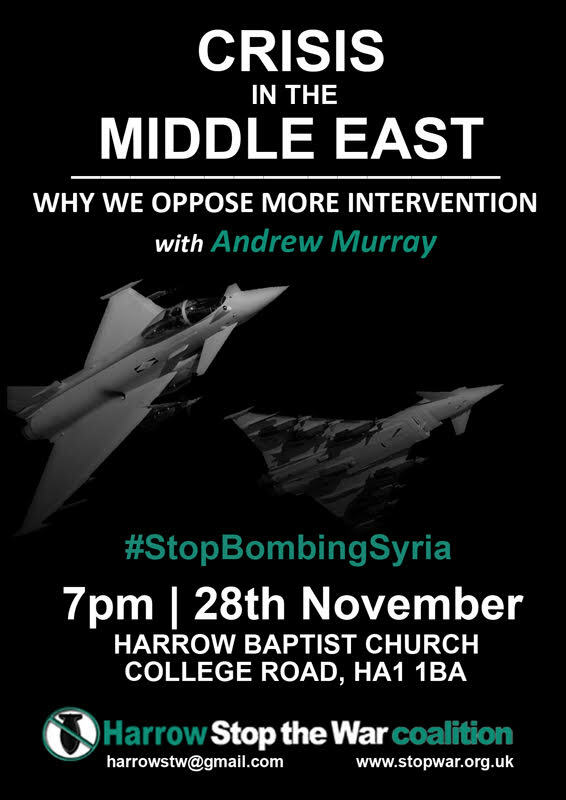 We will be joined by Andrew Murray, the current Chief of Staff at Unite the Union and the former Chair of Stop the War Coalition, who will make the case against more intervention in Syria – or anywhere else for that matter. The event does not require registration and is free to attend, but any voluntary contributions to help with the cost of putting on the meeting are welcome. 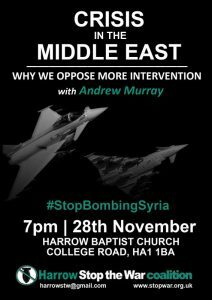 Come and join us to discuss the crisis in Syria and the region more widely, as well the risk of escalation into a direct military confrontation between the West and Russia. Shock statistics from the government reveal that cuts will force Barnet schools to lose more than £20 million, the equivalent of 555 teachers, by 2020. A new websi te set up by NUT and ATL, the newly merged education unions, shows the scale of the devastation to schools funding. 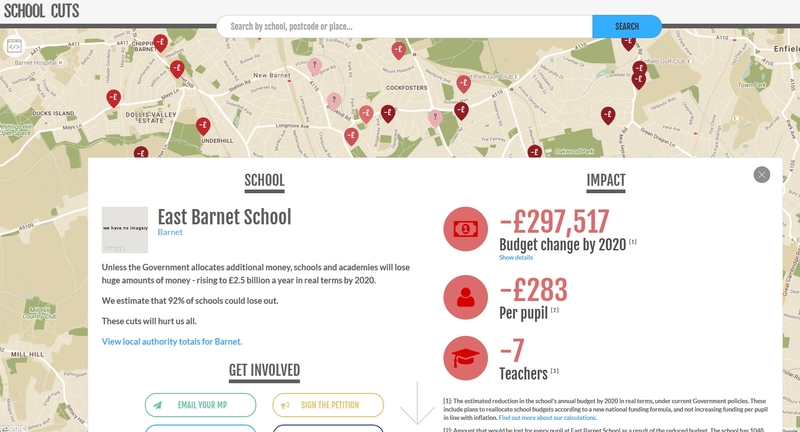 The new website allows anyone to enter their postcode or the name of their school to get an instant summary of the way the cuts will affect their own school. Try it here. 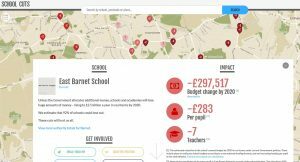 I looked at East Barnet School because we know that the headteacher of that school is vehemently opposed to the cuts and is prepared to say so publicly. Check for yourself. His school will be short of £297,517, the equivalent of a per pupil shortfall of £283 or the loss of 7 teachers. But this is not the whole story. 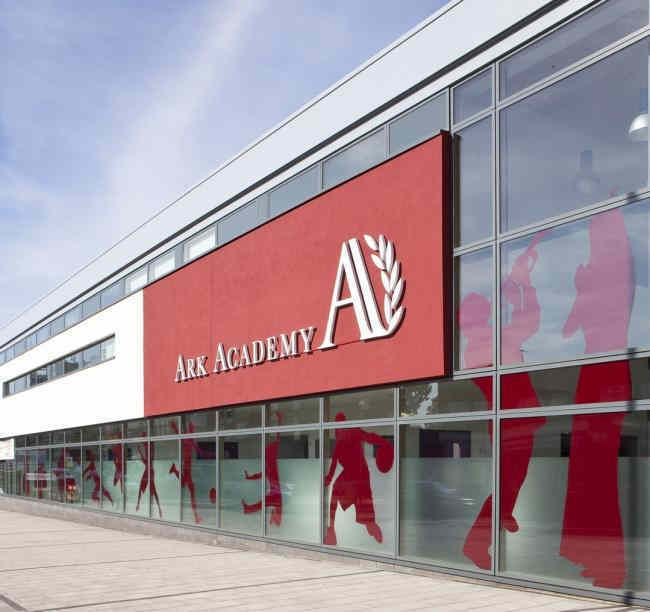 The website does not take into account the difficulties which schools are already facing. As the head of East Barnet School told our NUT meeting, he has already set a deficit budget this year. In other words, before the cuts on the website can take effect his school is already in the red. I think it will be very effective if we have some printouts of the results of all schools in Barnet at the public meeting. The NUT website calls on all to write to their MPs. At our public meeting we can decide whether this is all we can and should do. A Greater London Authority letter representing the views of Mr Khan, the Mayor of London, and planning report for October 31 state “the proposed school development is ‘inappropriate’ on green belt”. Full story in the Hendon and Finchley Times here. 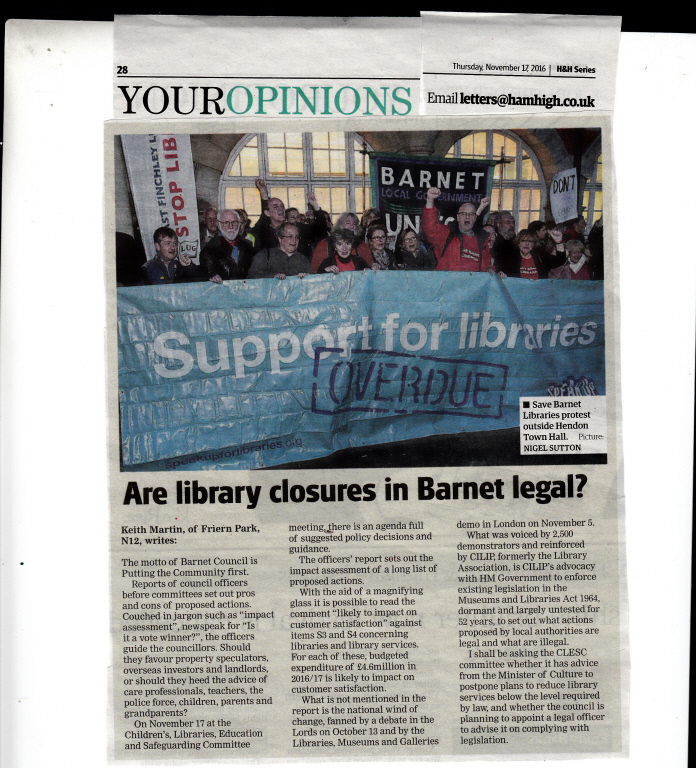 Barnet Trades Council urges all Barnet residents concerned about the issues raised to come to the meeting on November the 17th.